It doesn't look quite this good today. Yesterday I spent two hours with a weed eater. The coleus is still there but there is a lot less of the stuff. I went after the entire yard with the weed eater yesterday. All the edges were done. They had gone a while since last being done since we had a crew come through and thin down the Sea Grape and trim the Bougainvillea and Jasmine. While that was a couple months ago, I had come back from the dog walk in the morning thinking everything looked a bit shabby. That same morning it was suggested to me by someone that everything looked a bit shabby. After spending 30 minutes trying to start a gas powered string trimmer, I finally settled on the electric trimmer. That thing is terrible since the string on it breaks almost immediately if you strike a pebble so it had been ignored and under all the hurricane shutters. All this red and green bounty came from one single small bit of plant that I snipped off of a bit of the stuff that had been growing at the Shoppes in front of the bars the first dog walk that I ever took when I bought the house. I stuck it in the soil in the irrigation and this bit took off. I ended up with four feet tall of coleus and easily six feet across of the stuff. It made for a beautiful view first thing in the morning. The bougainvillea is up high, the coleus low and you can see all the palm trees in the background. Now it is cut back but I am sure that it will grow after moping for a bit. I'll be taking more of it out front under the orange tree. The front garden could use a little help. 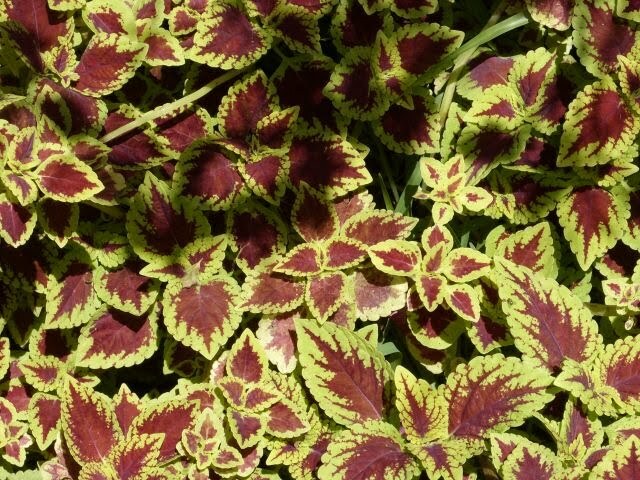 I could put some coleus on every desk in the city it seems. All it takes is one little snip and you're growing.